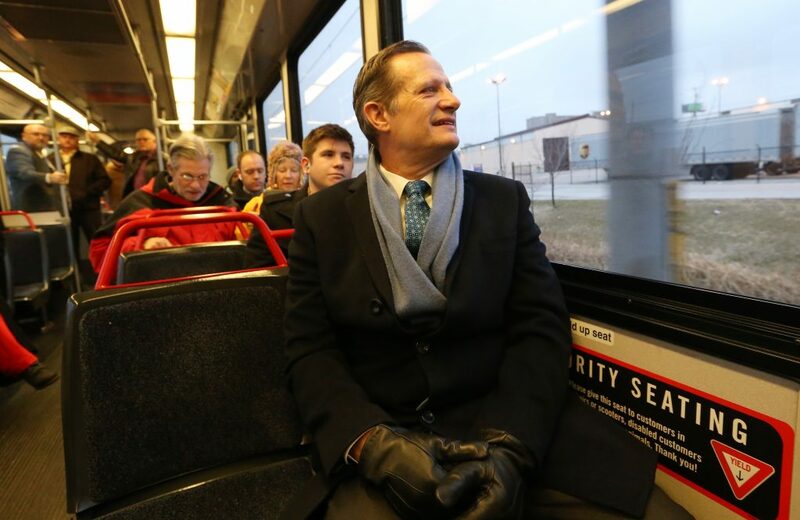 The new President and CEO of Bi-State Development, Taulby Roach is a frequent MetroLink rider. Today was his first official commute to Bi-State Development headquarters in downtown St. Louis. His normal commute consists of catching a Blue Line MetroLink train at the Skinker MetroLink Station near his home and riding it to the 8th & Pine MetroLink Station. From there, it’s a short walk to work. Photo Gallery: Check out Taulby’s commute to work. “That ride is a ride I normally take every single day and I take it for a reason. I enjoy riding the train in the morning and being part of that transit community – a diverse community of all different people,” he said. Taulby, a long-time transit supporter, appreciates an on-time, comfortable way to get to work. It’s one of the many benefits he enjoys. The ride on the train is relatively comfortable and usually no long waits. It would much more enjoyable if people just hanging out could be controlled more. My issue and main transportation, since I relocated job from downtown area, is the Metro Bus which is usually a horrible commute. The buses DO NOT have reasonable wait intervals…usually just missing one and wait time is 20-40 mins. for the next. Also, the areas are unsafe for anyone to just be standing (North city are is quite scary) around. I’m hoping to see improvements with the new addition to more buses as promised. Hope it’s sooner rather than later. Carla, thank you for providing your transit experience with us this morning and thank you for being a MetroLink and MetroBus rider. We will embark on a major redesign of the Metro Transit system via a transit plan called Metro Reimagined. Under this proposal, frequency on many major MetroBus routes will be reduced. In fact, 13 MetroBus routes are proposed to offer frequencies of less than 15 minutes. That’s quite the improvement from what we have today. This frequency will mean that you won’t have to wait at a bus stop very long nor will you have to wait for another bus if you end up missing one as you mention. In addition to faster service and better connections, we also plan to take a look at rider amenities, such as bus stops and shelters. We plan to roll out plans from Metro Reimagined later this fall. Stay tuned Carla!